On Sunday 31 October Minister Buyelwa Sonjica was replaced by Ms Edna Molewa as Minister of Environmental Affairs. Ms Molewa inherits a department mired in controversy and in need of urgent and efficient leadership. For many applicants in the boat-based whale watching and white shark cage diving sectors, the hope will no doubt be that the new Minister stops the chaos and confusion that has defined the DEA’s management of these two sectors to date. It will be an inevitable consequence of the Cabinet reshuffle that the appeals in these two sectors will be delayed even further. The delay may not be all negative as we would advise appellants to lobby the Minister’s office directly, impressing upon her the need to urgently correct the numerous legal and factual errors that have been made in the evaluation of applicants to date. The Minister needs to also urgently get a handle on the reasons why openly illegal boat based whale watching operators such as Raggy Charters in the Port Elizabeth area continue to receive the “protection” they do from prosecution and sanction. It has been exposed by this blog and other media that – for example – Raggy Charters’ BEE partner is a senior SANParks employee and SANParks is responsible for managing the Bird Island MPA where much of the PE boat based whale watching industry is based. Has a Fishing Company Been Hijacked? We are all no doubt familiar with the now infamous hijacking of Kalahari Resources by Sandile Majali (previous funder of the ANC with our taxes) and two of his partners who appear to have been mental patients. It would now appear that with the help of certain leading ANC members in the Western Cape, a black owned Hout Bay fishing company has now also been hijacked. The story goes as follows. In early 2009, the directors of Greys Investments Ltd approached Feike for assistance in attending to certain regulatory and governance matters. Feike agreed to assist on a pro bono basis as Greys Investments Ltd had a 2 ton lobster quota but also had 197 shareholders (12 of whom are now deceased). Greys Investments Ltd had previously been mismanaged by a series of boards with the result that by the time the shareholders met in Hout Bay in 2008 and elected the current board of directors, Greys could not uplift its fishing permit as it owed the SA Revenue Service (SARS) more than R80 000. No fishing permit meant that it could not fish which meant no income. As recently as 4 weeks ago, Greys was unable to secure its tax clearance certificate as discussions continued with SARS regarding a re-payment plan. This all the while as 185 shareholders awaited some income as shareholders of a fishing company allocated a long term fishing right. 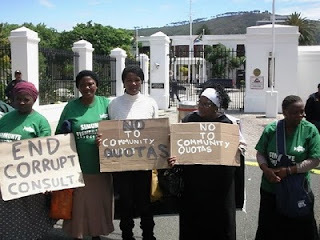 On 26 October 2010 Mr Maxwell Moss of the ANC Fishing Desk announced to a meeting of fishermen in Hout Bay that the ANC had assisted Muriel Davids (aka Marianne Brown, a former director of Greys accused of mismanaging company funds who was replaced as a director by shareholders) get “her” quota back. The fishers at the meeting raised serious concerns about this as Muriel Davids has no connection to the Hout Bay community as she lives in a wendy house in Darling and works in a fish shop which should have ordinarily excluded her from getting a fishing right as she is not reliant on fishing. So how did Ms Davids wangle a 2 ton lobster quota? On 27 October 2010, Feike consulted the west coast rock lobster inter-area schedule to determine how the ANC could have legally “given” Ms Brown/Davids her quota back. The inter-area schedule indicated that Greys’ lobster quota was now held by a close corporation called MAB & Sons Commercial Fishing CC (2009/053271/23). MAB is the acronym for Marianne Brown – the acronym for Muriel Davids would either have been MUD or MAD. Davids is the sole member of MAB and has no access to a fishing vessel or any fish processing or marketing capabilities. She appears to be nothing more than a front or paper quota which is unlawful under our fisheries laws. Feike then contacted the Department of Fisheries and was informed that Greys’ fishing quota was transferred out of Greys to MAB on the authorisation of the Deputy Director-General of Fisheries in September 2010. It would appear on the face of it that officials at Fisheries based their decision on the fact that there was a resolution signed by the shareholders authorising the sale of shares and the transfer of the fishing right from Greys to MAB. In return MAB apparently paid each shareholder R1000 or a total of R185 000 although the conservative market value of the lobster quota is in the region of about R600 000. Feike then proceeded to canvass as many of the shareholders of Greys to determine whether they did in fact sign the resolution and whether they received their R1000 payment. We requested every shareholder to acknowledge their response in writing and to append their signature next to their response. 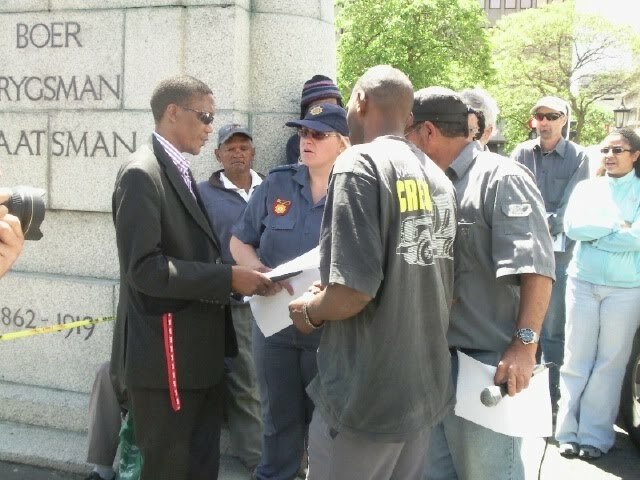 Of Greys’ 185 shareholders, more than 90 confirmed in writing or verbally that they had not attended any special or general meeting of Greys where a resolution could have been lawfully taken to dispose of Greys’ lobster quota; they had not signed any resolution; and they certainly had not received a R1000 for their shares. Indeed, Ms Davids, living in a wendy house in Darling and working at fish shop, could certainly not afford to pay R185 000 to the shareholders of Greys. Ms Davids’ own mother and sister (as shareholders of Greys) have also confirmed in writing that they did not consent to the sale of their shares and neither did they receive a R1000 for their shares. The conclusion must be that Marianne Brown (aka Muriel Davids) has acted unlawfully and perhaps even criminally by forging the signatures of 185 poor Hout Bay fishers and dispossessing them of their quotas by submitting a falsified transfer of fishing right application under section 21 of the MLRA. But did she act on her own or with the assistance of others? Chatting with Davids, it would be immediately apparent that she could not have concocted this scheme on her own. So what role did the ANC Fishing Desk play? Why did Maxwell Moss state to a meeting of local fishers that the ANC had assisted Ms Davids/Brown get her lobster quota back and how does the ANC get to do this? Moss even admitted to the Sunday Times that the ANC Fishing Desk did help Davids get “her” quota back. And what role did DAFF officials play in the hijacking of the Greys lobster quota which has denied 185 black fishers their right to benefit from a national resource? Perhaps most importantly, will the ANC and DAFF now stand up and assist the 185 shareholders (as the lawful and legitimate holders of the lobster quota) get their quota back? We will be monitoring this closely. We expect an apology from the ANC Fishing Desk and an investigation by Minister Tina Joemat-Petterson to determine if her officials acted unlawfully and on instructions from the ANC Fishing Desk. 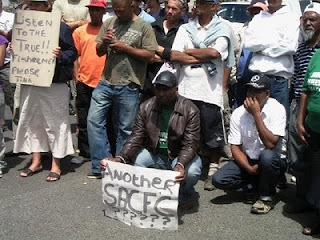 See the Sunday Times for more – http://www.timeslive.co.za/sundaytimes/article760908.ece/Something-fishy-in-fishing-quota-transfer. The date on which written comments on the draft small scale fisheries policy are due has been extended to 5 November 2010. The same comment procedure applies. Small scale fishers marched to Parliament on 19 October to voice their opposition to the Department of Fisheries’ proposed small scale policy. They handed over a memorandum detailing their objections (see article below) to the new the Deputy Director-General of the fisheries branch. Is there a point to DAFF? The Department of Fisheries (DAFF) has been in existence since June 2009 when the new administration recognised the critical ecological and socio-economic relevance of marine fisheries and fish farming. Fisheries was then unbundled from the department of “environmental affairs and tourism”. However, between June 2008 and April 2009 fisheries was left in limbo as the departments of environment and fisheries fought a bitter turf battle to control fisheries and the marine living resources fund. In the end although the administration of fisheries was moved back to the department of fisheries, the administration and management of fisheries is – frankly and honestly – in complete chaos and free-fall. DAFF and DEA have admitted that neither one actually knows who is in charge of what? Is DAFF in charge of fisheries? Is DEA in charge of the fish in marine protected areas? Is DEA in charge of managing sharks and whales? But don’t these fish and mammals subsist in a “fisheries environment”? DEA stated in the Sunday Times (17 October 2010) that DAFF is NOT in charge of fisheries conservation! Can you believe that? Talk about the epitome of utter ignorance and stupidity. So what is DAFF in charge of? Fisheries non-conservation? Huhh? Then of course Marine Week in October went by and DAFF was nowhere to be heard of or found. The WWF recently published its revised SASSI list which listed South Africa’s MSC certified sole trawl fishery as orange (essentially saying it and a host of other fisheries are poorly managed, which they are not), and DAFF remained silent, which may yet cost the industry a couple thousand jobs and untold reputational damage but these are minor issues compared to the importance of factional battles. Many in industry are actually now referring to Industry and WWF as the de facto regulators of SA fisheries. Other than costing the SA taxpayer and the fishing industry about R500 million annually in salaries, international business class flights to meetings and conferences, staff bonuses and Christmas parties, it is still unclear wPublish Posthat is the purpose of the Department of Fisheries. Oh, they do hold many important meetings and workshops! More than 2000 small scale commercial and traditional line fishers represented by organisations including the South African United Fishers Front (SAUFF), traditional line fishing organisations and the South African Abalone Industry Association are now united in opposition to the draft small scale fisheries policy primarily on the basis that this policy proposes to allocate rights to “communities” instead of individual fishers and the drafting of the small scale policy has to date completely ignored the interests and investments made by the more than 2000 small scale commercial and aritisinal fishers. Feike has previously pointed out on this blog that by seeking to implement a “community” or co-operative quota system, the draft policy was doomed to fail as “community” quotas are a romantic fallacy of a bygone era and allocation of quotas to co-operatives had repeatedly proved to be a spectacular failure perhaps best highlighted by the South African Commercial Fishermens Corporation (SACFC) and the Kalk Bay Harbour Lights Company. Opposition to the draft policy by fishers has grown recently after fishers realised that the department of fisheries would be seeking to force small scale fishers to operate in co-operative structures and that the initial statements by departmental officials that right holders in co-operatives would earn more money for their quotas were shown to be false. Co-operatives cost ordinary fishers a lot more money either through corruption and mismanagement as in the SACFC case or simply because now fishers must pay for the administration of large, corporate structures with board members who expect large fees. There is little doubt that should the department foist the concept of co-operatives on small scale fishers, the only people to benefit will be those that are presently promoting this failed concept. It is important to note that of the three people at the forefront of lobbying the department and the Minister in support of co-operatives and the draft policy, two were directly involved in previous failed fishing co-operative ventures that denied thousands of fishers access to their quotas and income. The remaining lobbyist, Masifundise Trust (represented by Mr Naseegh Jaffer), is on record in an affidavit to the Cape High Court as stating that fishing co-operatives – large or small – are doomed to fail. One must ask why they now so fervently support fishing co-operatives? Tsitsikamma Marine Protected Area to be opened to fishing? In 2007, the Deputy Minister of Environmental Affairs, Rejoice Mabhudafasi tried to sneak recreational and subsistence fishing into South Africa’s oldest marine protected area, the Tsitsikamma MPA. However, once the media exposed her attempt to further threaten an important nursery for line fish stocks, the Minister of Environmental Affairs, Marthinus van Schalkwyk, was forced to abandon the idea. The media expose unleashed an avalanche of adverse opinion from WWF, the department’s own scientists and academia that showed how ill-advised such a decision would be – whether from a biological or socio-economic perspective. However, various sources now confirm that Mabhudafsi – still the deputy minister of environmental affairs – is attempting a second covert attempt to get “recreational” and “subsistence” fishers access to the Tsitsikamma MPA. In 2007, the nub of the argument against opening up the MPA to fishing was based on a report by WWF which was accepted by the Department of Environmental Affairs. This report essentially stated that according to research conducted by the WWF, the total economic value of the MPAs along the Garden Route is estimated at R421-million. Opening up parts of Tsitsikamma would result in an overall net estimated loss of R31-million. Relaxing protection would result in a 16% decrease in visitors, which translates to a direct economic loss of R4,7-million a year. But the value of fish extracted from previously closed areas was likely to yield a once-off value of only R4-million, before fish stocks were degraded to levels outside the park. The WWF report confirmed that the benefits of fishing would also be extremely short-lived, and it is estimated that the natural capital built up in these areas would be fished down in approximately 33 fishing days. In other words, Mabudhafasi was prepared to destroy the biological benefits of having a protected area and which have been reaped over a period of more than 5 decades for 33 days of populism. And what did she have planned for the local communities that denuded an MPA after the 33 days of benefit? Open another MPA? Make more destructive, populist and pointless promises? And let us not forget that fisheries management is the prerogative of the Department of Fisheries – not Environmental Affairs. So Mabhudafasi cannot lawfully allocate fishing rights. More importantly, the fish under protection in the MPA are line fish stocks that were declared to be in a state of environmental crisis in 2000 with most stocks at below 5% of historical biological pristine levels. Mr Rainer Schimpf of Expert Tours CC, based in Port Elizabeth, has been nominated as The Herald GM Citizen of the Year. Rainer Schimpf wants to make people realise the beauty and vulnerability, as well as the potential, of the diverse marine life the Port Elizabeth region has to offer. Schimpf, an avid diver, offers diving tours in the Algoa Bay area through his company Expert Tours. In his spare time, he tries to raise awareness for the marine environment through his work for Ocean Messengers, a non-governmental organisation (NGO). The enormous potential of starting up a diving tourism business in Port Elizabeth was the reason for Schimpf and his family to make the move from Germany to South Africa in 1999. For the full story, see http://www.theherald.co.za/article.aspx?id=608545. This story was originally published by the Eastern Cape Herald newspaper on 22 September 2010. The Department of Fisheries held an important consultative meeting with abalone right holders to discuss a range of administrative, management and compliance issues. During the meeting the Department confirmed that 96% of the 150 ton quota had already been fished. An integrated security strategy and MCS. The Department reconfirmed its intention to partner with the National Intelligence Agency to root out poaching by investigating organised criminal syndicates. However, as many right holders noted, these promises of an integrated security strategy and an MCS strategy for the abalone fishery were previously made and have not been fulfilled. It is also not clear why the National Intelligence Agency needs to be involved when the South African Police and its Hawks division is charged with investigating organised criminal syndicates. Co-operative management. The Department once again put forward its intention to manage small scale commercial fisheries under a co-operative management type structure. DAFF officials initially promoted the idea with the carrot to right holders that they would receive substantially more for every kilogram of fish. This is of course is nonsense as buyers in China and Hong Kong simply do not operate on this basis and let us not forget that government made the same promises in the 1990’s in support of the establishment of the SACFC co-operative which not only failed miserably but of course did not earn the fishermen more money for their fish – in fact they got substantially less as under a co-operative, they had to pay administration and management levies and all sorts of other costs. TURF management. The Department once again mentioned that it views the territorial user rights fishery (TURF) management system as a failure without providing any evidence of this view (although we note that it oddly supports TURF management in its small-scale fishery policy). The TURF management system in the abalone fishery has not worked because the Department unilaterally (and unlawfully) decided to stop implementing it in 2004/2005 so as to appease certain right holders whose fishing zones were being depleted and allowed these right holders access to zones that were being properly managed by the TURF management committees that were set up for the zones. To abandon TURF management for inshore small scale fisheries management would simply invite the chaos, mismanagement and illegality that has defined the abalone fishery since the Department stopped implementing the abalone fishery policy and its TURF principles. Despite abalone poaching levels remaining high, the abalone fishery is bound to remain open and right holders should continue to fish for the remaining 2 seasons left of their long term rights which are set to expire at the end of 2013.